There is a 3 night minimum stay. The exception to this is the Christmas holiday period when there is a 7 night minimum for any stay that includes either December 25 or January 1. 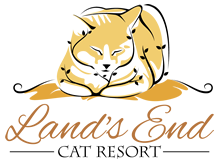 For stays of 3 to 20 nights the rate is $25 per night for one cat or $40 per night for two cats from the same household sharing a room. The rate is $60 per night for 3 cats in two rooms (adjoining or not) or $70 for 4 cats in two rooms. We offer a 10% discount for stays of 21 to 30 nights and a 15% discount for stays of 31 nights or longer. There is no additional charge for medication that can be added to the food. Other medications can be given as long as the cat is reasonably cooperative. There is a $7 per day fee for oral or ophthalmic or injectable medication, including insulin. Saanich Peninsula: $30 per trip. Victoria or West Shore: $50 per trip.